Former Gurkha Officer, held captive during the Civil War in Angola. I now work with Leaders and Teams, all over the world, with the aim of enhancing their effectiveness. The Gurkhas yesterday launched a full scale attack on one of the Australian Army’s worst enemies - a torturous obstacle a course at the Canungra Land Warfare Centre. The military experts reckon that just about every soldier in the Australian army has sweated and sworn his way through the officially named confidence course. Nobody cares to remember the experience let alone claim to have enjoyed it. Yesterday, it was the Gurkhas turn. 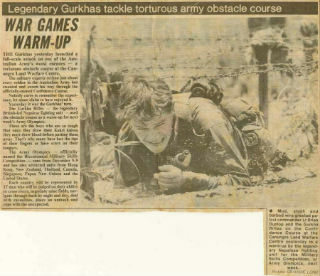 The Gurkha Rifles, the legendary British led Nepalese fighting unit used the obstacle course as a warm up for next week’s Army Olympics. These are the boys who are so tough that once the draw their Kukri knives they must draw blood before putting them away. That’s why many have lost the tips of their fingers or have scars on their tongues. The Army Olympics – officially named the Bicentennial Military Skills Competition runs from December 5 – 9 and has also attracted units from Hong Kong, New Zealand, Thailand, Canada, Singapore, Papua New Guinea and the US. Each country will be represented by 17 men who will be judged on their ability to cross rivers, negotiate mine fields, navigate through bush by day and night, deal with casualties, place an ambush and cope with the unexpected. Mud slush and barbed wire greeted patrol commander Lt Bryan Dunlop on the Confidence Course at the Canungra Land Warfare Centre yesterday in a warm up by the legendary Nepalese fighting unit for the military skills competition. We believe that if you are going to talk about leading in a challenging environment, it helps if you have! When the civil war re-started, my team and I were held captive in Angola for 4 days....here is the story.